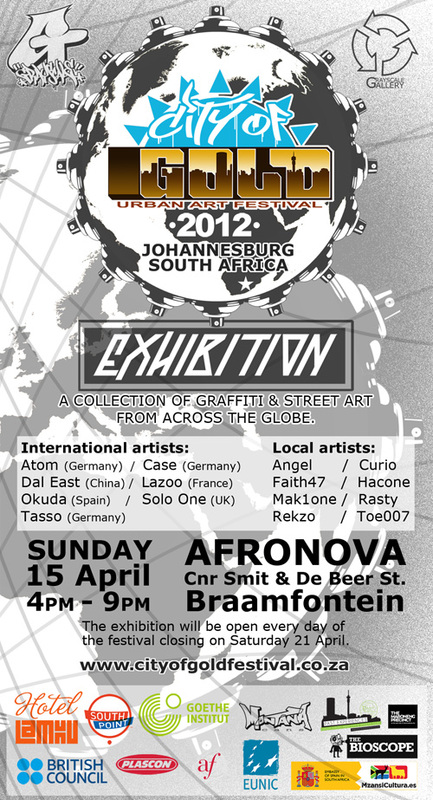 City of Gold Urban Art Festival 2012 opens this Sunday (15 April) at 4pm – 9pm at Afronova Gallery in Braamfontein, Johannesburg. The festival will kick off with an exhibition featuring local and international graffiti artists. This will be a chance for the public to meet the artists, and get a sneak peak as to what the week of collaborations will bring. The exhibition will be the first of its kind in South Africa, bringing together highly respected artists from around the world and pioneers of the local graffiti scene. Featuring a broad spectrum of artists and styles, audiences will experience the dynamic and versatile nature of this misunderstood art form. The exhibition will be open to the public every day for the week of the festival (10am - 5pm) closing with a walkabout on Saturday 21 April at 12 Noon.